They say that Eskimos have 50 different words for snow. When we track snow inside our Jeeps, we have a few choice words of our own. 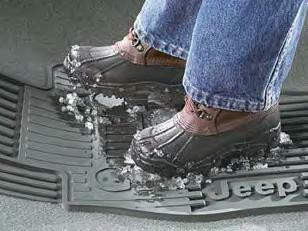 Excess snow and slush inside your 2005-2007 Jeep Liberty causes several problems. When the snow - including all the dirt, salt and grime inside it - melts in your warm cab, it can get absorbed in the upholstery, causing damage. And during the melting process, it can lead to your feet sliding around, making it hard to accelerate or brake. The solution to both of those problems is a high-quality slush mat. This set of four for your Liberty is custom made by Mopar to fit the specific floorspaces of the driver and passenger sides. 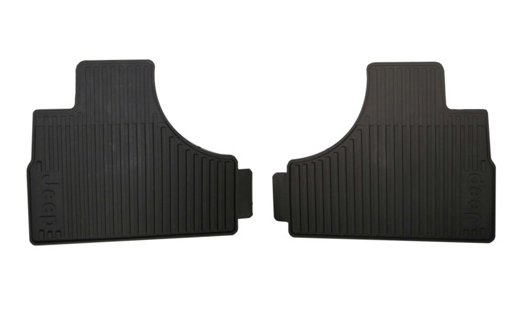 The molded rubber features deep ribs that hold the snow and ice safely, while giving plenty of purchase for your feet to operate the pedals. 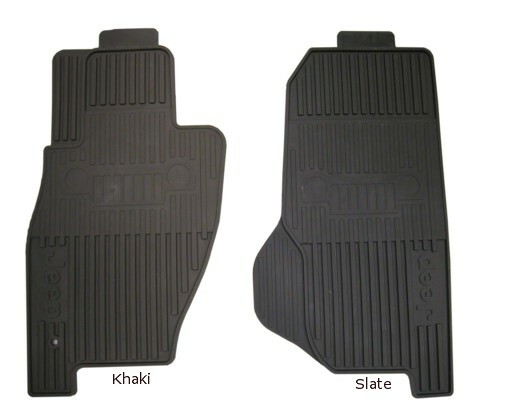 It's available in two colors to match perfectly with the interior of your Jeep. See for yourself the options we have available at Just for Jeeps, along with the big discounts we offer. Complete set of four with Jeep and Liberty grille logos. These mats are great quality and fit my Jeep like factory mats. Great mats, similar to weathertec, fit well in the car, my daughter is very happy!